Matt C: Two returning series from Image take pride of place on my pull-list this week. 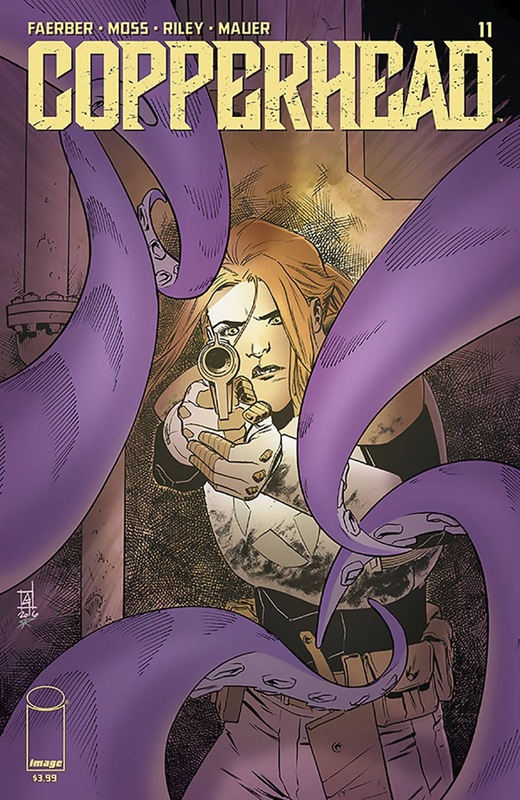 Copperhead, Jay Faerber's excellent sci-fi Western, has been off the shelves the longest, and has a new artist on for the ride, Drew Moss. Previous artist Scott Godlewski stays on cover duties but I'm fairly confident that Faerber's storytelling abilities will carry through and keep Cooperhead on a even keel through the visual change. Low has had a shorter hiatus but its return is most welcome as it had developed into arguably Rick Remender's most compelling and emotionally charged creator-owned series of the moment, and that's taking into account Deadly Class, Black Science AND Seven To Eternity. This new arc promises to expand the narrative outwards even further and, considering it's unpredictability so far, that can only be a good thing. Over at Marvel, Jessica Jones has quickly established itself as one of the House of Ideas most essential series, a surprise for those who'd assumed Brian Michael Bendis wasn't capable of this kind of brilliance any more. Another of Marvel's current greats, Old Man Logan, appears to have the Old Ol' Canucklehead locked up, and considering the quality of the series so far I don't really need to know anything more than that to believe it will be a great read. Andy H: A quieter week but still a diverse and exciting mix of reading to pick up. The supersize special that is Action Comics #975 continues the 'Superman Reborn' story started in last week's Superman #18 but, truth be told, I'm getting it for the back-up story featuring the art of Ian Churchill. 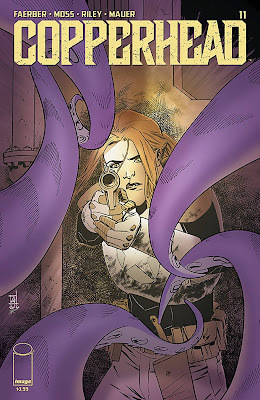 Jay Faerber is back from a long break with Copperhead #11. It's been a great read and I'm looking forward to returning to the 'Western in space' as Sheriff Bronson continues to clean up this new frontier. Drew Moss joins the title as artist on the series. Inhumans Vs X-Men #6 wraps up this week without any real delays or Marvel adding extra issues. Amazing! This will lead into the X-Men relaunch coming next month so possibly essential reading for X-Fans and as a bonus it's got Leinil Francis Yu on art duties. Also from Marvel this week is the return of Man-Thing, written by R.L.Stine. It's only a miniseries but it's always good to get your hands on a Man-Thing for your collection (fnar fnar!). Finally, there's Grass Kings from Matt Kindt. This looks like a real winner and the art of Tyler Jenkins looks fantastic. First issue is prestige format featuring a stonking 30 pages of story. Yep, it's a good week.